The weather outside is damp..my goodness but the interior of the house isn't complaining as I've paid some attention to catching up on household chores. July has been whizzing by, it's insane really. 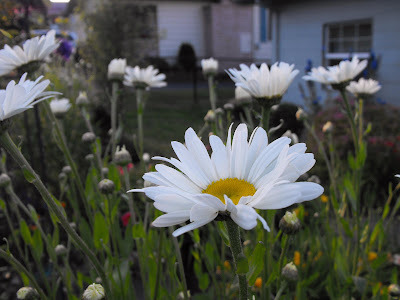 I caught a few new blooms on camera one dry evening after work. The Shasta Daisy's are mighty and cheerful this year. My favorite re-blooming daylily is blooming. 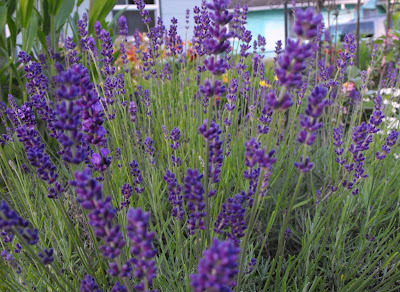 And the lavender is finally gracing us with it's pleasant scent. 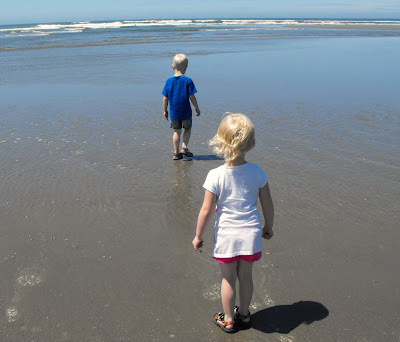 Last weekend I grabbed the kiddos for a spontaneous trip to the beach. We ended up at Seaside, Oregon and were treated with an incredible day. The weather was so nice, we stayed longer than planned and got a bit sun-kissed. The next day we had a large family gathering as some Dutch cousins were in the States visiting and we gave them a hearty welcome. This past week I attempted to make strawberry jam. I suspect my strawberry patch has produced over 50lbs thus far this season. It appears to be the year of the strawberry. 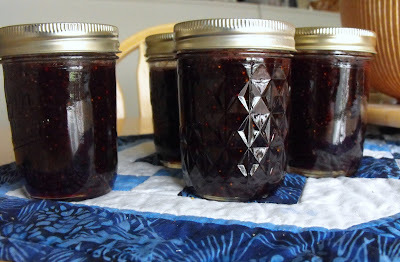 At any rate, I have never attempted to make jam before and let's just say it was a long night. 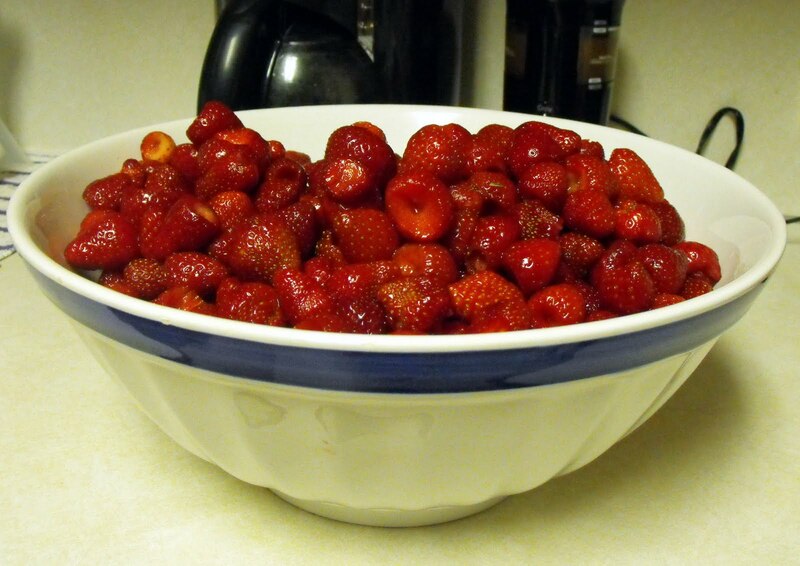 4 quarts of Strawberries ready to go! It was an interesting experience and I think I can do it again. I used the Ball Blue Canning Book as a guide and per my pint sized taste testers, I've done well. This coming week I hope to take some photo's of the vegetable garden as it's been growing gang busters. I'm really jealous of your strawberry crop. And that Daylily, ooh, la, la! I love it. Looks like you had a fun time at the beach. The photo of your little ones is delightful. I'm glad your garden is doing so well despite the rain. Hi Jenni. Looking good! I love making jams and preserves, but only do it every couple of years. There is nothing like the feeling of laying all the beautiful jars out and looking at them. I get such a feeling of accomplishment! Your shastas are just beautiful and I really like the eye level angle you took the photos from. We stopped by Seaside while we were in Oregon, but too cold and wet for the beach that day. I'm really impressed with your strawberries! Your jam looks yummy, homemade is the best. I remember when my Mom would make it with blackberries we picked. Daylilies are just starting to bloom here. Hi Jenni! 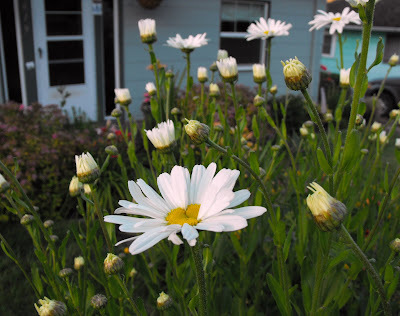 I agree about daisies - they enjoy this summer! 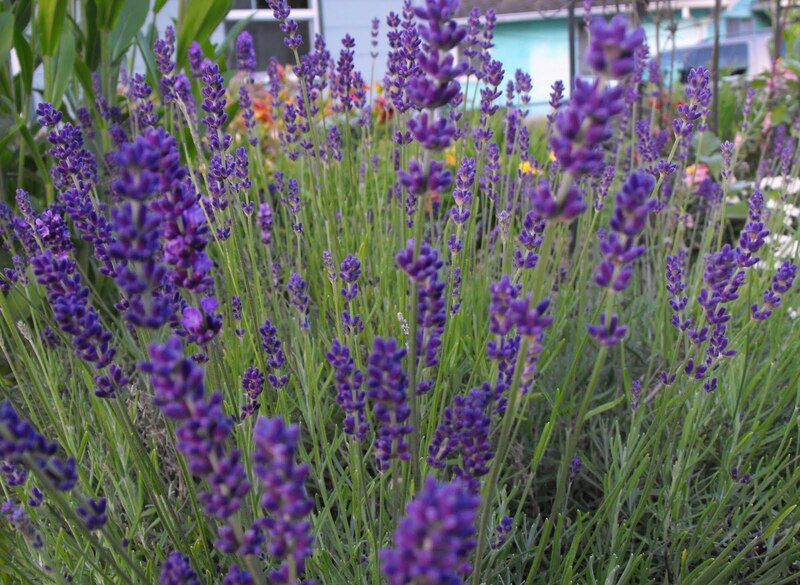 My Spanish lavender is finishing blooming, but English lavender just starts. As for the strawberries - you are a Strawberry Queen!!! Kudos to you on canning strawberry jam! I've never done that, I'm so jealous of all your yummy berries. I really need to look into growing some strawberries. The beach looks like fun. Some day I need to make it to the Ocean Shores area here in Washington to see the Pacific. I have seen it but I haven't gone wading in it. Wow Jenni ~ A wonderful outing with your little ones, beautiful daisies, a wonderful crop of strawberries that you used some for jam and a gorgeous daylily. Plus you have a veggie garden that is doing well. Good for you. What an awesome strawberry crop! The daylily is beautiful! It never ceases to amaze me the number of differnt varieties available in daylilies! Wow! Beach photos are awesome! I know what it is like to get caught up on house work! Congratulations on the your first batch of jam! You have inspired me. I have some strawberries and plenty of rhubarb in the freezer. I need to get on that. I love the thought of going to the beach with your children. Life is so short. Days like that are what it is all about. I enjoyed your post. Enjoy the summer. Your kids at th beach are so cute!!! You picked a perfect ay! Holy moly strawberries! This is the first year for my strawberry patch...actually I'm not sure what I should do with them now they are done. Cut them back? Leave them alone? what do you suggest? With a 50# harvest, I feel confident leaning on your strawberry-expertise! 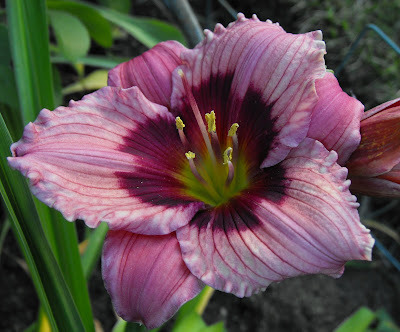 I am growing hundereds of daylilies.I've seen them flowering hundreds of times but I dnt know why I wait for the buds to open every day.I'd get up and go to my lawn straight away just to see how many of them are blooming and which ones.